With all of the opportunities to buy jewelry, it is easy to be tricked into buying a fake. Whether you are buying jewelry in a boutique, antique store, online shop, or local jeweler, you need to know what to look for so you know what you are getting. No shopper wants to buy a fake, especially with the prices of jewelry today. Here are some tips to help you spot the faux and protect the contents of your wallet. 1. Look for a stamp or hallmark. Real jewelry will be clearly labeled with the type of gold or metal, like 10 Carat, 14 Carat, or other numbers. The stamps will be on the inside of rings and it will usually be put on a tag on chains used for necklaces and bracelets. Hallmarks are the makers’ marks that jewelry designers use to label their pieces. Designers in different countries have different marks so you should be able to identify the mark from images online. If the piece does not have a stamp or a hallmark, then it most likely is fake. 2. Consider the shop. If you are buying online, you cannot get a good look at the piece. You should always be a bit leery of buying anything valuable online, especially if you cannot see a collection of close-up images. If you are buying from a reputable jeweler, online purchases are probably safe. 3. Look into the return policy. 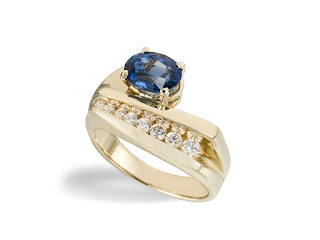 Most reputable jewelers offer some form of a return policy with their high quality pieces. Any piece that does not come with some form of return policy is probably not worth its price. 4. Look closely at the quality of the item. Pricy, valuable jewelry with have outstanding soldering. Clasps will be flawlessly put together. They will not be pinched with low quality findings. You should not be able to see any of the marks from the soldering process. 5. Be alert to the use of rhodium. This will be used to give a finish that resembles white gold. You can quickly identify rhodium by looking for signs of yellow gold on the inside of the ring. You can also look for stamps telling you what type of gold it is. When you see 10k or 14k, the yellow gold ring is probably plated with rhodium. 6. Get a certificate. When you are buying diamonds, you should receive a certificate from the Gemological Institute of America (GIA). If the jeweler cannot give you a certificate for your diamond, then do not buy the diamond because it is probably not real. Other pieces of jewelry, from colored gemstones to fine watches, should come with certifications, cards, or other types of paperwork. The paperwork should be on high quality paper and be printed with first-run ink. Photocopies should not be given, unless you get the original, too. 7. Test the gold. First, know that gold is not magnetic - so if it sticks to a magnet, get out of the store. Gold will indent if you bite it. Look for the carat markings. You can also scratch a ceramic plate with gold; the gold will create a streak of the same color.